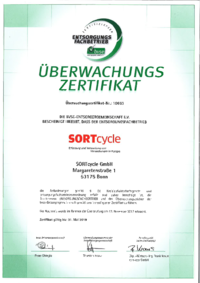 Established in June 2016, SORTcycle GmbH is the youngest member of the ASCON Resource Management Holding GmbH family. SORTcycle focuses mainly on the operational material flow management of recyclable materials, on the recycling of own volumes collected through the Group's own dual system ELS Dual and on the operation of own take-back and recycling systems. SORTcycle therefore runs its own site in Cologne; additional recycling centres and capacities are currently being established. With these activities, SORTcycle complements the ASCON Holding portfolio and closes loops – always with the challenges of a functioning circular economy in mind.